I spent my life being told to wear ironed clothes. Be neat. Be tidy. My mother irons everything; towels, sheets, underwear, even flannels. I wanted to know whether ironing did any good, and this is how I tried to find out. Despite my mother's obsessive application of the iron, I suspect that ironing shortens the life of a garment, with the heat, moisture and friction of ironing damaging the fibres. This should result in changes in the fibres, visible at high magnification. I contacted a number of steam iron manufacturers via their websites, and asked whether ironing has any material benefit beyond improving the appearance. I did find other people who questioned the need for ironing, but nobody seems to have actively examined it. As far as I can tell, ironing was invented as, and continues to be, a purely social contrivance. *If I ever receive any communications from steam-iron manufacturers, I will edit them into this step. To do this experiment, I needed to find out what ironing does to clothing, and what happens when clothes are not ironed. I started with a brand new, plain, white t-shirt, and examined it under a microscope, taking record shots through the eye-piece. I also found that the "super macro" setting on my camera, set at the finest resolution, provided useful images. One of the most important concepts in basic science investigations is "all else being equal". In other words, the test must be fair. To be fair, you should change the value of only one variable. So, the ironed and un-ironed fabric needs to be subjected as closely as possible to the same conditions; same number of washes, same wear and tear, same level of sweatiness and grubiness. The easiest way to do this is to test a single garment, consistently ironing one half, but not the other. I marked the shirt on the sleeves, "IRON" and "DO NOT IRON". To eliminate the factor of handedness, I bought a pack of two shirts, marking them up on opposite sides. I wore the t-shirts on a day-to-day basis, changing into one or the other when I got home, occasionally wearing them under other clothes. To make sure it saw plenty of mileage, I broke the house laundry rules, washed the t-shirt in with the normal "dark and coloureds" loads of laundry, instead of the less frequent "light and white" loads. This was not a problem for the fairness of my final results, because both sides of the t-shirt were subjected to identical treatment. One slightly artificial factor; each shirt was subjected to at least one extra go with the iron between washes - this experiment was only carried out over a few weeks, when most items of clothing are subjected to years of [potentially-harmful] ironing. 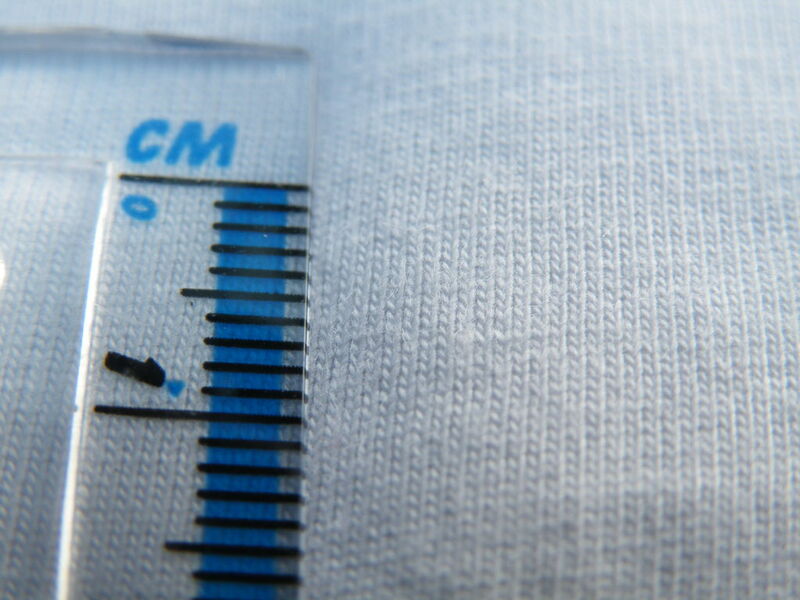 After wearing and washing the t-shirts for as long as possible, within the time-constraints of the Scientific Method Contest, I again examined the fabric using super-macro photography, hoping for a visible difference between the ironed and non-ironed sides of the garment. As you can see from the photographs, there turned out to be no obvious visible difference between the ironed and non-ironed fibres. It would seem, therefore, that the only positive effect of ironing is to smooth out creases on the gross scale. Therefore, beyond pandering to unquantifiable ideas of "smartness", there is no actual point to ironing clothes. • More shirts, on more people, to give a more significant data-set. • A wider range of lifestyles: the relatively sedate life of a teacher may simply not subject a garment to enough stresses to reveal a difference. Maybe involve a sporting team for a season? • Handedness may be significant, subjecting one side of the garment to more wear than the other, so involve both right- and left-handed participants, and give each two shirts (each with the "iron" side on opposite sides). • Some fabrics may be more or less susceptible to damage by ironing than others, so a range of fabrics should be tested, with a variety of natural and man-made fibres. Since I have your attention for a moment, you might also be interested in some of the things I make but haven't posted as instructables. Look here. Your link does not appear to link to anything. It LOOKS like a link, but it doesn't do anything when you click on it. And right-clicking the link does not give me the normal selection of "link" options. I love this experiment and the contextual ads that Google serves alongside it. What ads? I don't see any ads. Hehe, I had to log out and switch off adblock, but that *is* funny! It kills the larvae of cothes moths too. Extremely important to understand this if you have a problem with holes appearing in your clothes or have seen clothes/carpet moths around your house. They are fantastic at hiding themselves in the seams, wrapped up in the same colour as the garment so you can barely spot them. Not a problem for most of us but in the tropics of Africa there is a parasitic insect - the tumbu fly or putzi fly. The female fly will lay eggs on damp clothes put out to dry. The eggs hatch on contact with skin and the small maggots burrow in and take up residence for a while until they pupate. Ironing would kill the eggs of the fly. Love your work & I’m glad to see I’m not the only one that has thought (& tested) this pressing issue. There is definitely more comfort to a heavy cotton shirt after it’s been ironed, after similar testing to your experiment & under the scrutiny of a magnifying glass for comparison the fibres of the ironed shirt were flat and smooth the non ironed shirt had a sandpaper like appearance admittedly the ironed shirt appears to be getting thinner so perhaps ironing does compromise the integrity of the material. Or I just need to get a hobby ! A hobby... or a PhD? Dry tumbling is neither beneficial to textiles. Ironing started back when it was normal to air dry clothes. However due to humidity in air the textile could in storage sour. So ironing would get rid of excess moist and leave the fabric easier to store. Also ironing sheets and towels straighten the fabric which softens the wrinkles leading to more comfort. wash your inners or regular clothes n dry them away from sun light, you will start noticing a kind of smell from your clothes after doing so for a month. The smell is due to the bacteria that start feeding on your clothes. To get rid of bacteria, you either has to put ur clothes under uv rays ( thats why people use sun to dry their clothes) or heat them so the bacteria get killed. There are places where you do not get proper sun throughout the year hence ironing the clothes is the ultimate option. Even when you dry ur clothes under sun there are chances that bacteria survives under the layers of clothes which is been taken care by ironing. Hope you get ypur answer now. Feel free to try it. And be ready that someone tells u to put extra deo on your clothes. Do you, by any chance, use pasta as socks? My main objection to your methodology is the use of a cotton jersey T-shirt, which is not commonly ironed. A better sample would be a cotton dress shirt. However, it's interesting to note that you disproved your theorem that ironing caused undue wear to the fabric. Did you notice my comments about my mother ironing everything? When they were first married, my dad was quite surprised that my mom would not iron sheets, pillow cases, or underwear. Grandma had him spoiled. Guess he learned to live with it because they were married almost 55 years. I used to work with a guy who only wore monogrammed white dress shirts and his wife took them to the dry cleaners. They were bleached, ironed, and starched to a crisp. i can't imagine it was comfortable. I also can't believe that those fibers weren't damaged from that kind of treatment.